Successfully Added Car MP3 MP4 Player with Bluetooth (Black) to your Shopping Cart. Car MP3 MP4 player with Bluetooth comes in classic black color. This is a convenient and cost effective way of listening to your favorite music whilst driving. This model comes with a Bluetooth function and wireless FM transmitter. The CVHI-C17 is easy to use, plugs straight into your car's cigarette lighter charger and works straight out of the box. This model comes with an internal memory of 2GB, enough to fill it with hundreds of your media files. In addition, you can extend the use of the memory by inserting a TF card in to its external slide memory slot. This compact form factor MP3 & MP4 player will provide you with great sound quality on your journeys and best of all comes with a useful equalizer setting. On the MP3/4 player: It has excellent broadcast clarity to my truck radio. I can finally listen to my music though it is a bit quirky to use the "down" arrow to increase volume but that is manageable. Thanks chinavasion guys. 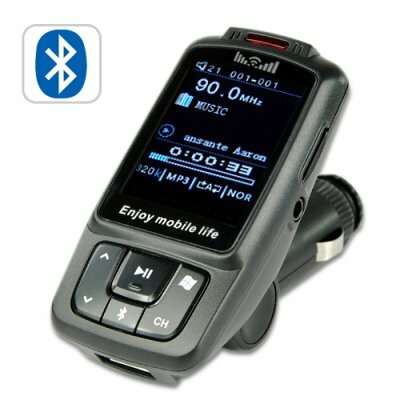 I like the gadget /Car MP3 MP4 Player with Bluetooth (Black)/ that I bought. It is cool. Remote controller sometimes not work well but it is better than my previous mp3 transmitter. thanks guys Good luck on your business. Hey I order this one and another item as my first purchase. What can I say for this device: it came nicely packed, it is well made, good quality plastics. Mp3 works fine with my car and blue tooth also - service was excellent and every question was answered duly. Thank you Chinavasion! This was my first order to ChinaVasion but absolutely NOT my last. It was just within four days correct delivered by Fed-Ex in the Netherlands!!!!!! My compliments to ChinaVasion and Fed-Ex. The installation was very easy. After trying several free frequencys on my car audio, I finally found a channel with noisefree performance. My MP3 files sound cristalclear in stereo. And even cellphone calls sound reasonable over my car speakers. The remote control however must be pointed straight and held close to the control window for any reaction. Possibly the included button cell is allready empty. Over all I am very content. Good quality for an amazing price!! Thanks ChinaVision team from the Netherlands!!!!!!!!!!!!!!!!!!!!!!!!!!!!!! !